It seems like there’s a Subway on just about every corner. But can you really “eat fresh” there? 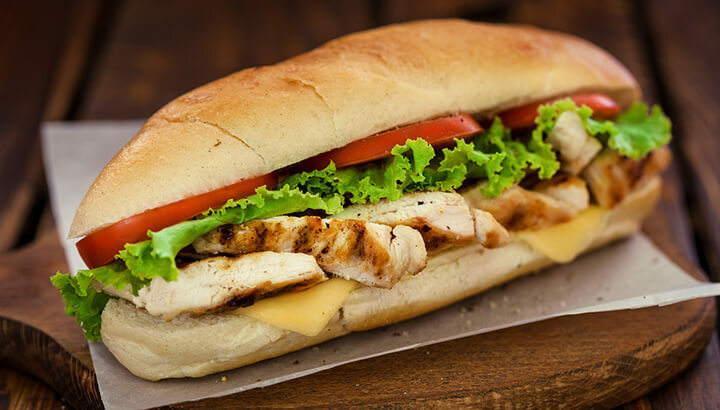 If you need some convenience in your life without compromising your health, here’s the best and worst of the Subway menu. Is Subway really fresh food? With millions spent on marketing, and the Subway guy who lost several pant sizes, it’s easy to think that Subway is a healthier fast food option. 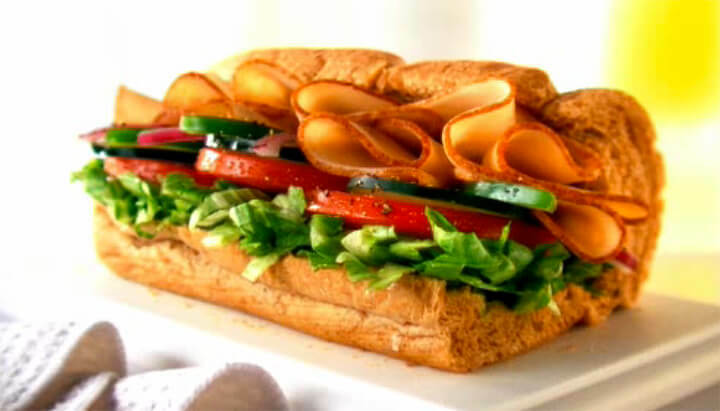 Even the American Heart Association endorsed Subway with “heart-healthy” menu options. But is the menu really as healthy as it seems? Even the healthiest bread option, 9-Grain Whole Wheat, contains 31 ingredients, including added sugar. Most of the bread varieties, including the flatbreads, contain soybean oil, which has been linked to detrimental health effects. Many of the dressings, like Buffalo Sauce, contain artery-clogging canola oil and corn syrup, which many experts believe is even more dangerous than sugar. Just about everything has added sugar, including the “healthy” soup options and fan-favorite Fat-Free Sweet Onion sauce. Just because it’s fat-free doesn’t mean it’s healthy. Some of the veggies, like yellow banana peppers, pickles and jalapenos, are soaked in the preservative sodium metabisulfite. This chemical has been linked to allergic reactions, skin irritation and digestive distress. Many of the meats, like the meatballs and roast beef, contain added “natural” flavors and sugars, which are anything but natural. In general, the menu contains scores of artificial flavors, preservatives and colors — like ferrous gluconate, which keeps olives black. Is that really necessary? There are no organic options on the menu, meaning that the vegetables and fruits were grown with GMOs and preservatives. In addition, the meats were not raised sustainably or humanely. So can you really “eat fresh” at Subway? Like all fast food options, it’s not really “fresh” by nature so much as fresh by design. These foods are shipped from large warehouses and made to last longer than they would in nature. We don’t recommend Subway. But, that said, it’s still not the worst of fast food. And, the company has announced that they are committed to removing artificial flavors, color and preservatives from their food by this year. So, if you really must stop at Subway during your lunch break, here are the best and the worst choices on the menu. In general, stick to the “Fresh Fit Choices” for a good idea of what direction you should be heading in. This much-beloved bread variety is, sadly, the worst choice on the menu for its sodium content and 50-plus ingredients. A six-inch sub of this kind of bread contains 470 milligrams of sodium, followed by the Monterey cheddar at 340 milligrams. While higher in carbs than some of the others (40 grams for a six-inch) this hearty choice contains four grams of fiber, unlike the white flour varieties. It also contains more calcium and iron than some of the other choices. At 280 calories, it’s not much better than the other breads in the carb department, so it may be a bit misleading. However, the multigrain flatbread does contain six grams of fiber, the most out of any bread choice. 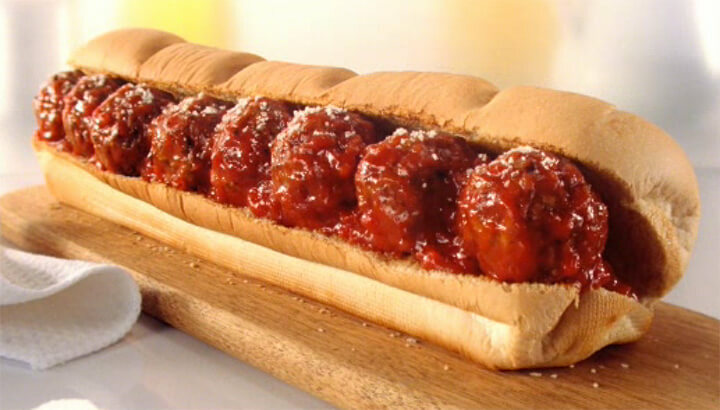 It may taste delicious, but a six-inch meatball sub on Italian herbs and cheese bread with all the fixings will set you back 570 calories and 25 grams of fat (11 grams saturated). There’s also a starting amount of sodium, with 1320 milligrams per serving — that’s half the daily recommended intake of sodium for the day. Try a six-inch on 9-grain wheat bread with the whole range of vegetables, like lettuce, spinach, onions and tomatoes. Skip the cheese and opt for the creamy nutritional goodness of an avocado instead. Also, skip the mayo and add flavor to your sub with Dijon mustard and black pepper. You’re looking at 390 calories, 25 grams of protein and 50 grams of carbs. Go for a six-inch sub on multigrain flatbread to save on some carbs. Load it up with veggies and mustard for an easy 300 calories. Make sure to skip the cheese and calorie-filled sauces. But if you must add a pinch of flavor, we recommend a “light” amount of the oil and vinegar. While the oil is part canola oil and part extra virgin olive oil, the vinegar is, at least, as natural as possible. For low carb options, try the Black Forest Ham Salad or the Turkey Breast Salad. Make sure to take it easy on the dressing! The cookies are some of the most processed items on the entire Subway menu. Plus, they contain heaps of sugar that will guarantee you a post-lunch slump at your desk by about 2 p.m. If you must indulge in a crunchy snack, go for SunChips Veggie Harvest flavor. They contain 30 percent less fat than regular potato chips and contain no artificial flavors or preservatives. You really can’t go wrong with fresh fruit, though it would be better if they were organic. Apples can help whiten teeth, cure constipation and boost immunity with their vitamin C content. Plus, you’ll get a natural source of sugar to curb that sweet tooth. Make your own subs at home with sustainably-sourced ingredients. If you really want to “eat fresh,” cook at home. That way, you’ll know exactly what’s going into your food. The next time you’re out, pick up some organic veggies at the supermarket (the options are endless), organic meat, sustainably-sourced cheese and freshly baked bread. Make your own sandwich at home, then top it with one of these all-natural DIY dressings. A homemade meal will always taste way better than anything you picked up at a fast food chain. 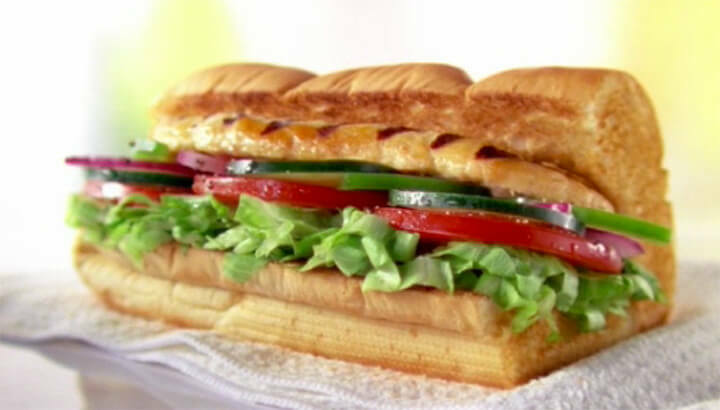 Remember: If a sandwich takes five minutes to make at Subway, then it’ll take five minutes to make at home, too. Previous articleAre Air Fryers Really A Healthy Way To Cook Food? Hey Buddy!, I found this information for you: "Eat This (Not That) At Subway". 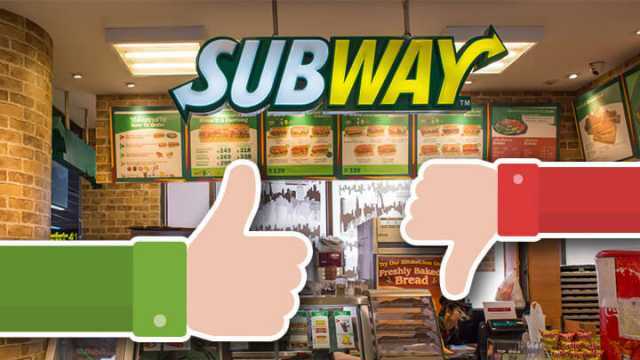 Here is the website link: https://www.thealternativedaily.com/what-to-eat-at-subway/. Thank you.